Women bosses who bully their ambitious young rivals are one aspect of female careerism that is under-explored. Bella Barlow and A.C. Smith at least start to redress the balance with a miniature musical played out underneath Waterloo’s railway arches as part of London’s vibrant Vault festival. It’s witty, of the moment and full of appropriately edgy music. Its biggest fault is that we leave hungry for more. A minor quibble is the tacit assumption that it’s chiefly women who have to give up all for career. Evelyn Hoskins, as a petite, harassed Jess, the put-upon P.A., and Tiffany Graves, as the statuesque Samantha, her impossibly exacting boss, are perfectly cast. 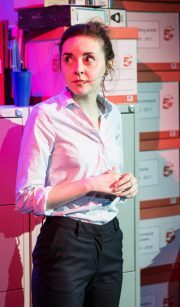 For Jess, the happiest moment is a light-footed dance around the filing cabinets, showering herself with the paper circles from a hole-punch as she sings through the pain of yet another late night vigil in the office, sustained by the hope she’ll one day make it to greatness. Strutting in killer heels, Graves as Samantha towers above her as the tension mounts over a red key to a forbidden red filing cabinet in a plot redolent of Bluebeard. And then suddenly, just as it gets into stride, the show’s over and we’ll never know whether Jess will perpetuate or break the cycle of abusing hard-won power.